Background and Aims: Coronary intervention through radial artery is a preferred over femoral route. Different vasodilators are used to prevent radial artery spasm. Till date there is no study to compare the effects of various vasodilator regimes during radial coronary angiogram in Nepal. We aim to compare the efficacy of different vasodilator in our patients. Methods and Result: This is a single centre, prospective randomized trial between Verapamil, Nitroglycerine (GTN) and cocktail (Verapamil with GTN). 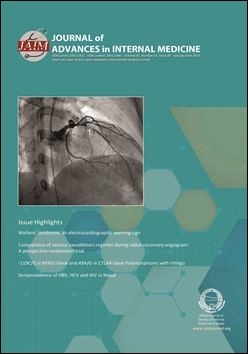 All the patient undergoing coronary angiogram via radial approach, without the contraindication were randomized by a computer generated randomization protocol. Patient undergoing coronary procedures via the radial artery were divided into three groups. Patients in group A received intra-arterial cocktail (2.5 mg of Verapamil plus 100 mcg Nitroglycerine in 10 ml of normal saline), patients in group B received Verapamil (5mg) and patient in group C received Nitroglycerine (200mcg). Heparin of 3000U was given intravenously in all three groips. Altogether 207 patients underwent transradial coronary angiogram, 203 were randomized after exclusion. Over all Radial artery spasm was reported in 28 patients (13.79%). There was no statistically significant difference in spasm between the three regimens however when grading, there was significant higher grade of spasm in Verapamil group (13.23%, P value < 0.05). When comparing Verapamil and GTN separately there was significant higher spasm (21% vs 7%, P value < 0.05) with higher grades of spasm in verapamil group.